We can offer you a variety of options for cuisine enjoyment, be it from our lobby bar, serving pool snacks and drinks, as well as our new, open-air restaurant, “Enak”. The bar in the newly renovated lobby, offers fresh Bintang draft beer, a wide choice of Australian wines and various cocktails. We also have a tobacconist offering the finest cigars originating from Cuba. 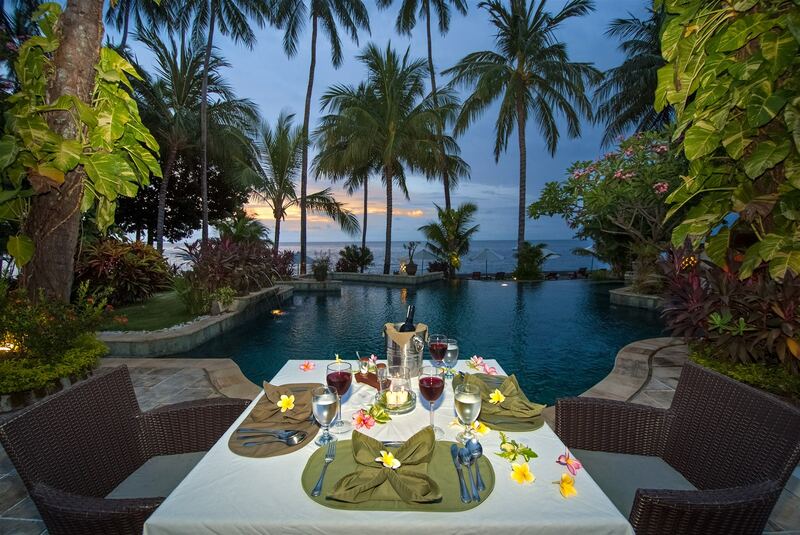 In our open Restaurant, a few metres from the ocean, is the perfect spot to enjoy a perfect sunset. We serve light refreshments, but can also offer more substantial snacks, from Bruschetta with salad to crispy pizza, all at our natural stone/rock swimming pool. Our fresh fruit juices are in a class of their own. For this reason, we only buy our fresh fruits from the well known fruit market in Bedugul. 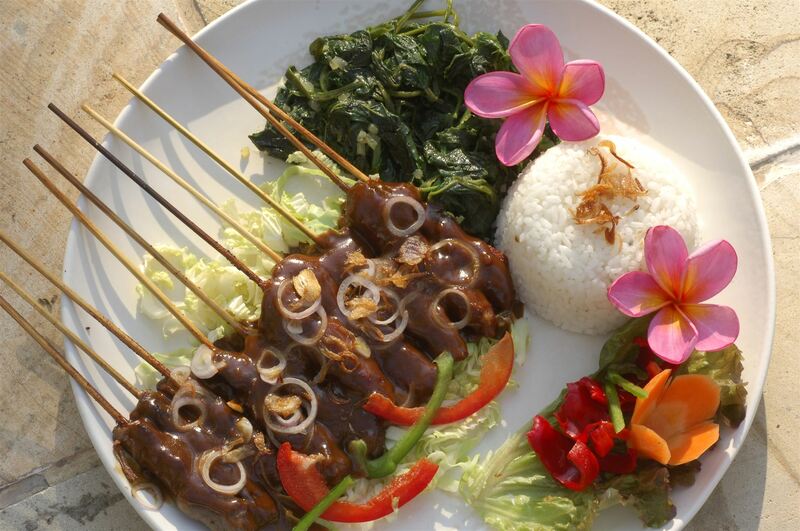 The Indonesian word “Enak” means “sumptious”. Of course, a name such as this needs to be earned first! Our menu offers traditional Indonesian and Balinese food, traditional international cuisine, and naturally, fresh fish or shrimp salad. Is Soto Ayam soup too exotic? Of course we also offer delicious BBQ Spare Ribs with roasted Potatoes! Why does the restaurant have no walls? Who would want to deny themselves this view, where it almost appears as if the swimming pool becomes seamlessly one, with the Indian Ocean. 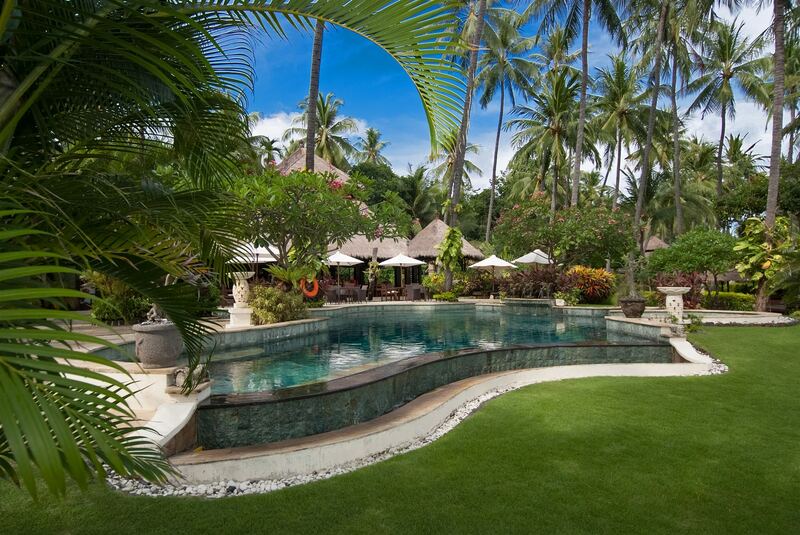 As background on the other side, a garden of Palms, lush grass and evergreen Kambodja trees. Our 5m long breakfast buffet is open from 7 o’clock in the morning, every Sunday, where traditional Balinese specialties are offered and who could refuse a romantic candlelight dinner at the pool? Still not convinced? 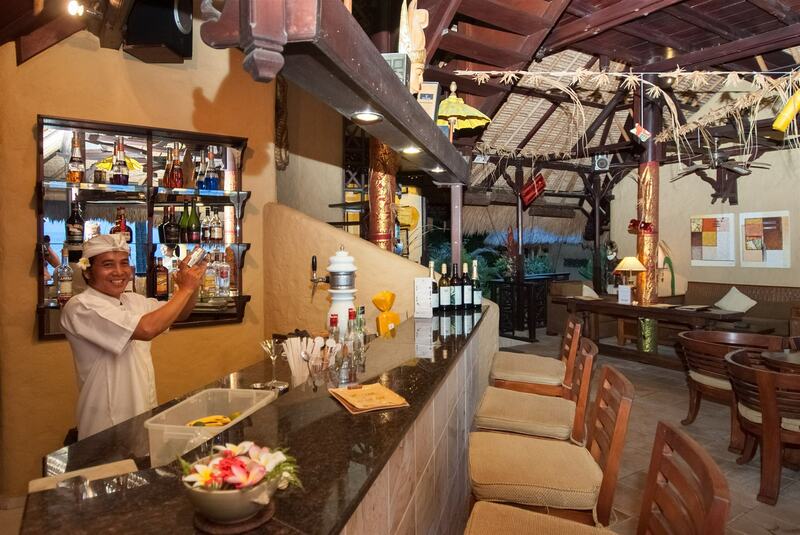 We will also gladly serve you, on request, delicious speciality cuisine and drinks, in your private bungalow or villa, for a minimal extra cost. Now that you know, should we set a place for you? *All prices are based on the current menu cards and act as a price guide only. The prices and the conent are not binding and can be changed without prior notice. 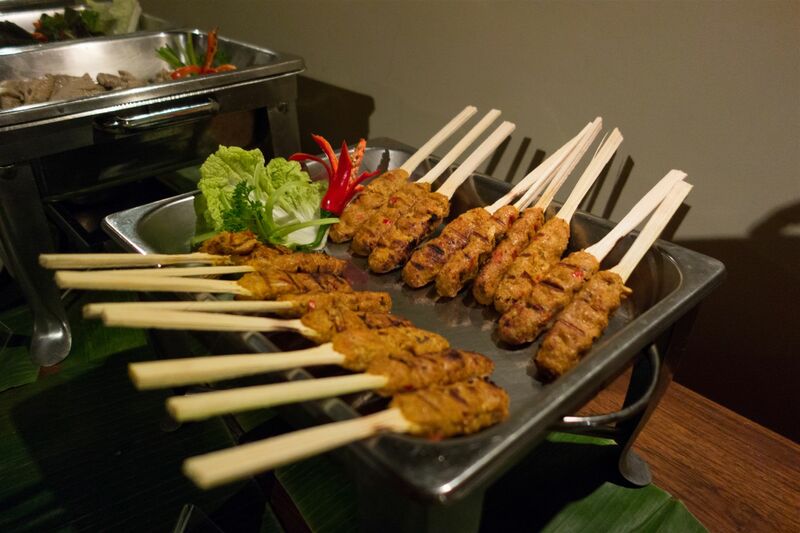 Theme nights with special selections like Balinese Rijsttafel or BBQ buffets are available.